Chicken and Cauliflower Roast is an easy dinner packed with flavor. Serve with some french bread and butter for a great meal. Heat oven to 425ºF. 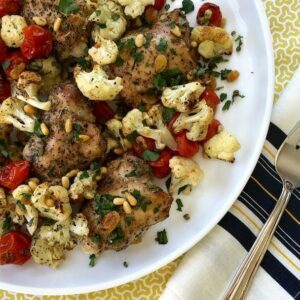 In a large bowl toss the chicken together with the cauliflower, cherry tomatoes, olive oil, Italian seasoning, salt and pepper. Transfer everything to a rimmed baking sheet; roast until chicken and cauliflower are golden, about 40 minutes. In a small bowl combine capers, pine nuts, golden raisins and parsley and sprinkle over chicken to serve. *If your meat department doesn't have skinless, simply remove the skin at home with some kitchen shears.